Oy. Where to begin. Just over a month ago, I spoke at a Jewish high school about issues in Karaite Judaism – particularly as they implicate Shabbat and technology. Speaking with me was a conservative rabbi who happened to grow up at the same conservative synagogue that I did – though we did not know each other previously. This synagogue housed the KJA and our Shabbat prayers from 1984-1990. After a quick introduction – curses started flying. 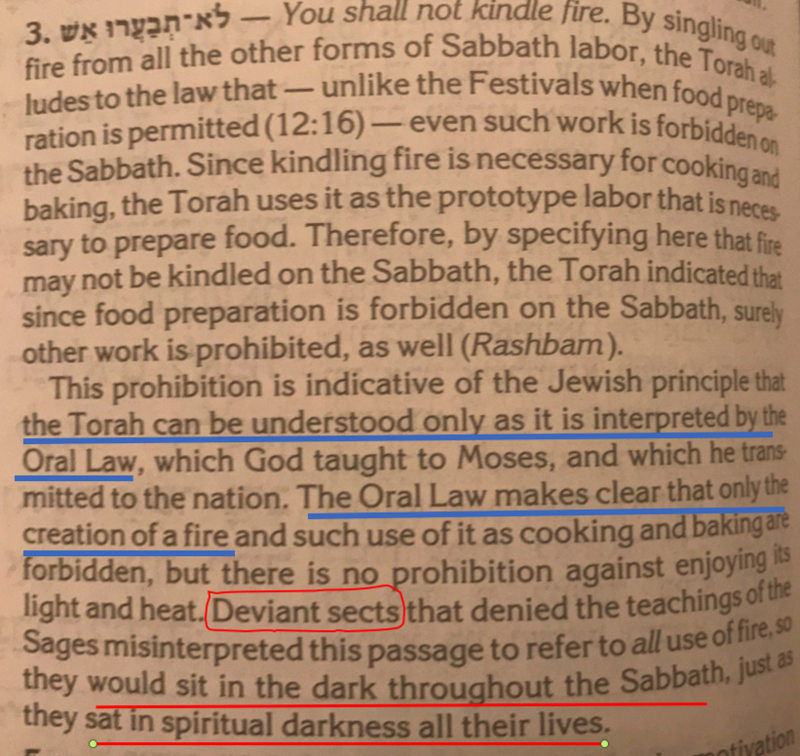 As all discussions of Shabbat observance go, we quickly got to the fact that the medieval Karaite interpretation of the fire prohibition in Exodus 35:3 is that all fire is prohibited on Shabbat (even those fires that were lit before Shabbat). In essence, the Karaites and Rabbanites disagree on whether the word “teva’aru” means to kindle or to burn. I wanted to use this particular verse to show the class that every translation of the Tanakh is an interpretation and that when they read the Tanakh in English they are being taught someone’s interpretation of the Tanakh. In order to separate themselves from someone else’s interpretation and theology, they need to understand Hebrew and look at the linguistic and biblical evidence for themselves. 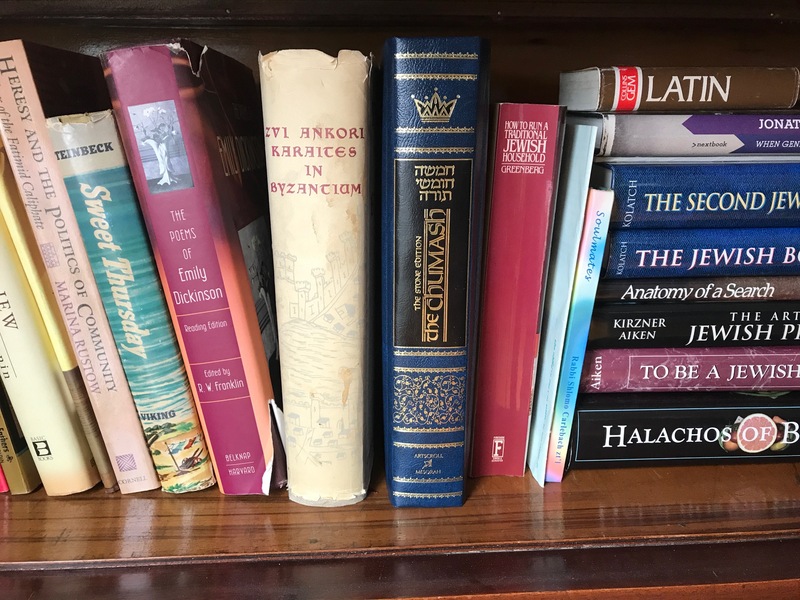 So I asked the class’s teacher to grab me any Tanakh from her bookshelf so that I can show the class that the translations (almost universally) assert the Rabbinic opinion. She grabbed me an Artscroll Chumash with commentary. Artscroll, as can be expected given its Rabbanite outlook, translates the verse in accordance with Rabbanite opinion. You shall not kindle fire in any of your dwellings on the Sabbath day. This is a perfectly fine translation, because the book is intending to promote the Rabbinic view. If I were to do a medieval Karaite rendering of the verse, I would translate it as I have set forth above: Ye shall cause no fire to burn. And this would be okay too. But then, I took a look at the comment and read it aloud to the class. And as soon as I read the part about “spiritual darkness” one of the students said, “snap.” Sigh. Snap indeed. As an aside, this reminds me of a line of poetry from a Karaite scholar named Israel Ha-Dayyan Ha-Ma’aravi (al-Maghribī) (14th Century, Egypt). In his poem, he wrote, “If you see me sitting in the dark on the eve of the Sabbath, do not think I am in distress, for God is my light in the darkness.” What a beautiful concept. In any event back to the class – I then pointed out something subtle about the comment. The comment is implying that if you read the Tanakh in Hebrew according to its plain meaning, you would come to the same conclusion as the deviant sects (i.e., the medieval and modern Egyptian Karaites), and that you need the Oral Law to teach you that the meaning of these words is something different from how you would read them naturally. As a Karaite and I do not believe that you need the Oral Law to teach you the plain meaning of the text. For example, as a Karaite I open to other views that are at odds with both Rabbanite view and the medieval Karaite view – where the plain meaning dictates. 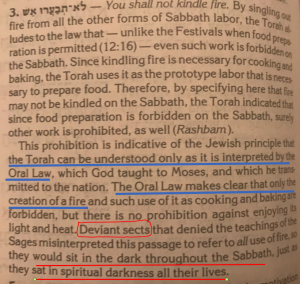 On this verse in particular, I am very open to the possibility that the Karaites are correct with respect to the fact that fire is not permitted even when lit before Shabbat, but that the Sabbath day (“Yom Shabbat”) only applies to the Yom (that is, the day) of Shabbat (and not to any night time periods). This view is different from both the traditional Karaite and traditional Rabbanite view. Does that make me a deviant sectual deviant? The Karaite Press plans to release some of Israel Ha-Dayyan’s works in the coming months. To be fair, later (particularly Byzantine and European) Karaites did indeed allow fire to burn on Friday night (interpreting the verse in line with the Rabbanite opinion); though this is not the majority Karaite view today. Okay, Shawn nice post, but I don’t get it…what where the curses? Certainly, if “sigh” is all that was said we are setting a pretty low bar for cursing. Perhaps it was reading the polemic in the ArtScroll? I am not a scholar at all nor a religious Jewish woman, but I like to read your pieces. I always find them very interesting. Now re this no living fire on Shabbat, not only no light, but also no warmth. I find it hard to accept that in the past people had to sit in the cold, shivering. How can that be the intent of that verse? I’m sure we had a conversation about this, but how does electricity fit in with the interpretation of the verse? Is it akin to a fire burning, or to water flowing from a faucet? Scientifically electicity is not fire and is akin to the flow of water. I know of some Karaite Jews who only use fluorescent lighting on Shabbat (i.e. to avoid causing a flame to burn). And I know of some Karaite Jews who only use electricity if they are not engaging in a commercial transaction on Shabbat. I’m confused by the last sentence, what might that commercial transaction be? Is it with respect to the electricity, or separate? This commercial transaction is indirect at best. The claim is that the fact you are eventually being billed by the utility company constitutes a forbidden transaction on the Shabbat day. I have never afreed with this argument. Is your electricity specifically billing for use on the Shabbat, or are you paying a flat monthly fee? If you receive an electricity that shows billings on shabbat, that (according to some) is engaging in a financial transaction on Shabbat. My paycheck covers an entire week; does my leading services on Shabbat constitute a transaction? People love to ask me that. The modern utility of Electric Energy usage has complicated our implications and interpretations of Exodus 35:3 indeed. Driving an older make vehicle that had an internal combustion engine on Shabbos was indeed in reality “kindling” a flame. I remember a time when Orthodox Jews abandoned their vehicles on the side of the freeway at sunset on shabbos and walked home if they got held up in stuck traffic! This awesome convenience power of electricity that we now have assimilated into our daily lives usage, involves the considerations and defining concerns of the issues of What do we consider is our habitation boundaries; by that I reference from where that power source is being “supplied” into your abode, and if it is utilized and activated on Shabbos to kindle light, (note I have not even yet distinguished if it is used Shabbos day &/or night). Do you consider the utility transformer, that is the conductor of the power & current, that may or may not be situated on the street, or running under ground and then running into your abode, or perhaps it is on your driveway but ” inside your gates”, is this “inside your “habitation” and personal responsibility as a property boundary? What of the digital power usage meter that is affixed ON your exterior home that constantly requires a nano amount of power coursing through it continuously itself to function, even If you have NO appliance in use inside or outside the confines of your abode? Do you have a means to temporarily disable the power for purposes of doing so to deactivate it just on Shabbos? Probably not. So, in reality that power & current is still in a state of activity whether you kindle the knob “power on” the lamp or not. Is that flow of current “kindling”? No. The actual power usage is charged by the kilowatt/hr as the current is actually passing through that meter, (the voltage however is present and there regardless) being made available from the power transformer and passing through your abodes individual power usage meter. So, unless you have the means to totally shut off that meter completely, current is still passing through that meter and the commercial transaction is chronologically current based on that usage, even if you pro-rate and average your annual power usage by making your monthly payments. Shawn, the parts you underlined and encircled in red are the standard-issue propagandistic Orthodox-Rabbinic position that I have encountered a gazillion times in numerous place. The hostile Ortho’s deserve no break as if this vicious stance is unique to Artscroll’s authors. I can’t upload a photo, but the Etz Chaim Chumash commentary (Conservative) simply notes that some consider electricity to be fire and therefore prohibited. Others liken it to tying a temporary knot, not lighting a fire. But Rabbi Scroll certainly has his agenda! Hi, Do you know why Nehemia Gordon hasn’t written a Karaite translation of the Torah? No. But even that would be his opinion of what should the translation should be, and even there without a commentary you would not understand his translation. For example if he said that the verse means “Ye shall burn no fire on the Sabbath day.” You clearly understand his views of the fire prohibition, but what about the “day” portion (which I have said I am open to). Unfortunately, some have come to view Samaritanism as a form of Judaism and its adherents as Jews, which is erroneous. No religion or faith system that rejects the Nevi’im and Ketuvim as well as the sanctity of Har haBayit & Jslm. can fall into the Judaism category, no matter how tempting it is to classify it as Jewish. Most Rabbanites seem to agree on these facts, about which the Qaraites and Samaritans are in consensus. Other than the reality where dozens of Samaritans are Jewish in the *technical* sense by dint of having being born to Jewish mothers, the term “Samaritan Jews” is an oxymoron. The Samaritan tradition did not “reject” the N’vi’im adn K’tuvim; they and “mainstream” Judaism separated before the time of the Prophets, probably about the tie of the High Priest Eli. Samaritan Judaism represents the Judaism of what would eventually become the Northern Kingdom (Israel), while Rabbanite, Karaite, Ethiopian, Indian, Chinese, and most other Judaisms are linked to the Southern Kingdom of Judah. The Beta Israel of Ethiopia, whose origin goes back to the time of King Solomon, also had, until they were brought to modern Israel and adapted to Rabbanite Judaism, a Scripture that differs from ours — Joshua, Judges, and Ruth were included in the Ethiopian Torah, and the books of Sirach, Judith, Esdras 1 and 2, Meqabyan, Jubilees, Baruch 1 and 4, Tobit, Enoch, and the testaments of Abraham, Isaac, and Jacob, which we do not include, are part of their Bible — but they are considered Jews, so there is no logical reason to exclude Samaritan Judaism. In Temple times, there was conflict between Jerusalem-Temple Jews and Gerizim-Temple (Samaritan) Jews, and that conflict led to the anti-Samaritan prejudice among many Rabbanite authorities that leads them to deny the Jewishness of Samaritan Judaism. I find the mention of remembering our spiritual darkness very interesting. I am always disappointed with the arguments about who’s interpretation is right, in my own studies I rather ask why the Holy One wants us to do something. Fire was used in most work and industry back then and we understand that no work is to be done. Likewise cooking is done when preparing for the Shabbat. Understanding that no fire is to be kindled, either starting a new fire or keeping one from the previous day going is forbidden is easy to understand when we know it is only forbidden during the daylight hours. The Holy One will not let us freeze or stumble around after dark, especially in winter, so it makes sense that after sunset we can make a fire for warmth and light, not for any kind of work that will be paid for. Thanks to the members who pointed out the spiritual darkness and daytime part to me. But… in order to reach a near certainty that YHWH meant to prohibit even letting any fires burn during Shabbat’s daytime alone rather than also nighttime necessitates a comprehensive analysis of all the appearances of phrase “Yom haShabbat” and “Yom X” (some other day of the week), in order to determine just how plausible this interpretation can be. Secondly, the safety argument is not entirely convincing in a critical examination, knowing that blind people can navigate their way around familiar surroundings without stumbling. Thirdly, all forms of Melakha are out of the question on Shabbat, not only only work that will be paid for. Incidentally, the difficulty in accurately translating the word Melakha stems from the fact it is a combination of “work” and “task”. As in dont sit there and do nothing to put out a fire just because it is a day of rest by puting it out one would be working a view that as been woth me for many years any comments? Except that the Egyptian Karaites themselves are hardly open to different interpretations of the Tanach, except perhaps those of the Rabbanites, whom they mimic and practically idolize, though they won’t admit this, even to themselves. That’s why Egyptian Karaism is a fossilized and declining movement, an insular community which will probably be dead in a generation or two. I like the interpretation “Yom Shabbat” day of Shabbat, which does not include the night. Maybe this is why Byzantine Karaites lit Shabbat candels? I don’t think Adonai intended us to sit in the dark on Shabbat- how could we read the Tanak? I turn electronics off on Shabbat, so there is little else to do. Sometimes I read the Tanak to pass the time, other times I have company or are in the company of others. If Karaites use florescent lighting to keep the mitzvah, thats cool. If Rabbanites burn candels, thats cool too. The thing with the Rabbanites is that they feel the Oral Law holds a monopoly over Judaism. Other interpretations are called heretical, which is is eerily reminiscent of the Catholic Church. This Orthodoxy should not be allowed to define who is a Jew. The controversy of kindling vs. burning is an interpretative matter and no Jew should condemn another Jew for something that is not clearly or definitively explained in the Tanak. We should accept differing opinions without labeling the other opinion as heretical. I stand with Karaites in their opinion that plain meaning of Tanak makes the most sense. This however, might mean that someone sits in the dark on Shabbat, or someone uses florescent light on Shabbat, or someone lights candles on erev Shabbat. All of these expressions of Shabbat observance are customary and should be acknowledged as such. Neither Karaite, nor Rabbanite should condemn his fellow Jew for their observance of “the” Holy Day of the week. We are after all brothers in faith. Jewish mothers is this not incorrect? Is it not through the father not the mother ? Kalev, I take your above question that you are asking if JEWISH heredity is passed through the paternal ancestry from generation to generation, versus through the maternal ancestry. This is also the standard of Hebrew succession for Sephardi ancestry. It sounds like you’re referring to the religion, yes, but I don’t know from which verse(s) that is learned, do you? Also, it seems this verse recognizes a man born to a Jewish mother and Egyptian father is Jewish but has no tribal identity. Lev 24:10 Now, the son of an Israelite woman and he was the son of an Egyptian man went out among the children of Israel, and they quarreled in the camp this son of the Israelite woman, and an Israelite man. were in the bible said to light candle for the shabbat . and you got comand us? My post is to address the post by Melech ben Ya’acov who is obviously a Rabbinical Jew. 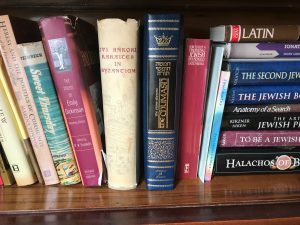 You write “Karaites themselves are hardly open to different interpretations of the Tanach, except perhaps those of the Rabbanites, whom they mimic and practically idolize, though they won’t admit this, even to themselves.” First, let me say I was brought up in a Conservative Rabbinical home that observed Shabbos every week. Karaites from my experience are much more open to interpretation, if the interpretation has some scriptural basis in the Tanak and make sense in terms of its plain meaning. The power of Karaite Judaism moving forward is that more Jews are beginning to question whether the Oral Torah supersedes the written Tanak. I think any reasonable survey of the Tanak reveals there is no mention of an Oral Torah, there may be inferences or convoluted references, but NO CLEAR EVIDENCE that there was anything but a written Tanak given to Moshe Hanavi. With the internet and mass communication, Karaite Judaism will only gain more traction as Jews come to realize the Mishna and Gemara are the opinions of men and not Adonai. While you tend to believe that Karaite Jews idolize Rabbanites, I’d like to know what cool aid your drinking, cause I need some too. The only reason Karaites read Rabbanite literature is because Rabbanite commentary on the practice of Judaism is exhaustive and extensive. Rabbinate practice however, is not always right, especially if it conflicts with the plain meaning of the Tanak. There are Jews who realize this, and our numbers are growing. As the Rabbinical Orthodoxy loses its hold on defining who is a Jew, people who want more from their faith- than the collective opinion of men, will turn to Karaite Judaism. Rather than being a fossilized relic, Karaite Judaism will grow stronger, reach Jews based on the soundness of its reason, and give true meaning to life according to the plain meaning of the written mitzvot. How can I contact you? I would like to discuss Karaites in Istanbul.